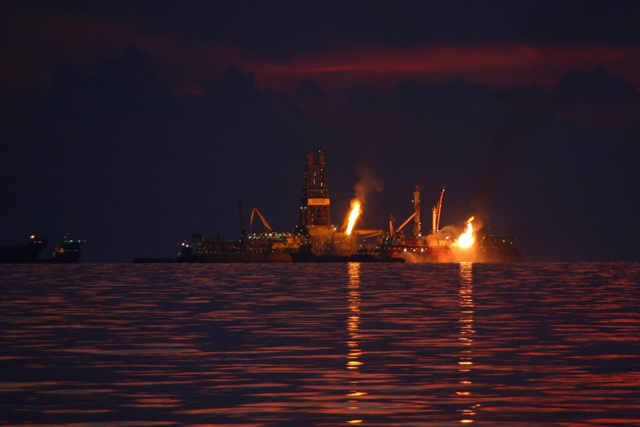 Flames from burning natural gas and oil continued months after the <em>Deepwater Horizon</em> oil platform sank in April 2010. Americans learned just how dirty and dangerous offshore oil drilling is 50 years ago. On January 28, 1969, a massive oil spill in the Santa Barbara Channel triggered the modern environmental movement. More than 3 million gallons of oil gushed from an offshore well starting on that fateful day. This deluge of toxic crude coated 35 miles of beaches and thousands of birds and marine animals. It helped lead to the passage of the country’s most significant environmental laws. But it didn’t end offshore drilling. After a temporary moratorium, oil companies quickly went back to drilling and spilling along U.S. coastlines. We didn’t learn the right lessons from the ’69 Santa Barbara spill, so we suffered through the Exxon Valdez spill in 1989, the BP Deepwater Horizon disaster in 2010, the Refugio Oil Spill in 2015, and countless smaller spills, including more than 40,000 recorded by the Coast Guard in the Gulf of Mexico. Meanwhile, the Taylor Energy oil spill has steadily been spewing up to 30,000 gallons of oil per day into the Gulf of Mexico since Hurricane Ivan destroyed its platform in 2004. It has quietly become the biggest spill in U.S. history with no end in sight. Now, the Trump administration wants to ignore all those lessons and drastically expand offshore oil drilling in every major U.S. ocean, while rolling back offshore drilling safety rules. The consequences of such wildly reckless moves are unthinkable. The drilling expansion would contaminate coastal communities, kill untold marine animals and doom us to climate chaos. So we’re returning to where it all began, Santa Barbara’s beautiful and vulnerable coastline, to remember the ’69 spill and chart a new course into a smarter, more sustainable future — a future without dirty and dangerous offshore drilling. Join us January 28 outside the Bureau of Ocean Energy Management office in Camarillo to protest the Trump administration’s offshore expansion plan. Find details at www.endangeredoceans.org. It’s time to end fossil fuel leasing in our public waters and phase out all offshore drilling in the U.S., starting immediately. The best moments of my life have been spent surfing, sailing and diving in the Santa Barbara Channel. Its beauty and biodiversity still inspire and astonish me — even as I’m always vaguely unsettled by the offshore drilling platforms on the horizon. I know a lot of people feel the same way. For 50 years, we’ve watched the costs of offshore drilling continue to mount. As the Independent reported last week, Santa Barbara is struggling to prepare for sea-level rise of more than five feet by the end of the century, potentially costing billions of dollars. The legislation that resulted from the ’69 Santa Barbara oil spill — including the National Environmental Policy Act, the Clean Water Act and the California Environmental Quality Act — isn’t enough to contain the inherent risks and damage from offshore drilling. Nothing can ever make offshore drilling safe, and that’s especially true in the treacherous, remote Arctic waters where the Trump administration plans to offer the first new offshore drilling leases later this year. That’s a disaster waiting to happen. It’s only a matter of when and how widespread the damage will be. Our oceans and atmosphere are now warming faster than climate change forecasts warned a decade ago. Hurricanes, wildfires and other extreme weather events are pummeling the country. Carbon dioxide emissions continue to climb even as we exceed the carbon budgets needed to prevent climate catastrophe. Ending the most dangerous, most expensive and most damaging form of our oil addiction — offshore oil drilling — should be a no-brainer. So on the 50th anniversary of the Santa Barbara oil spill, let’s finally listen to that wake-up call and work to end offshore drilling in the United States. Blake Kopcho is the oceans campaigner for the Center for Biological Diversity based on Oakland.